Finally I am confident to show my midriff although I think I still have to workout a bit more to sculpt it. There are certain parts of my body fats that I really wish to trim them but they are so stubborn. No matter how I exercise the stubborn fats it’s just there, sigh… or perhaps I have been feasting could be the reason the fats don’t seem to go away. I am glad that I decided to go for CoolSculpting Treatment @ Clique Clinic few months ago and now the results start becoming more visible. 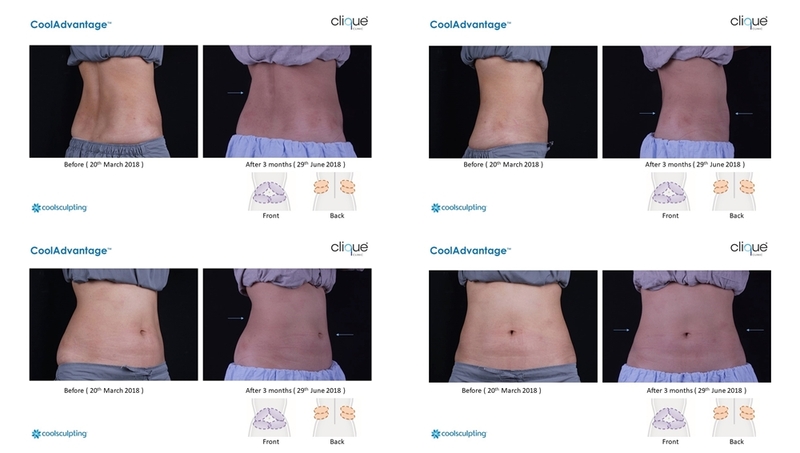 For those that who is new to CoolSculpting, this is a non-invasive fat reduction treatment on targeted areas. It's an innovative way to contour your body by freezing unwanted fat away with no surgery or downtime. It uses controlled cooling to freezes fat, causing the body to remove the dead cells, which is then naturally eliminated the stubborn fats from your body. 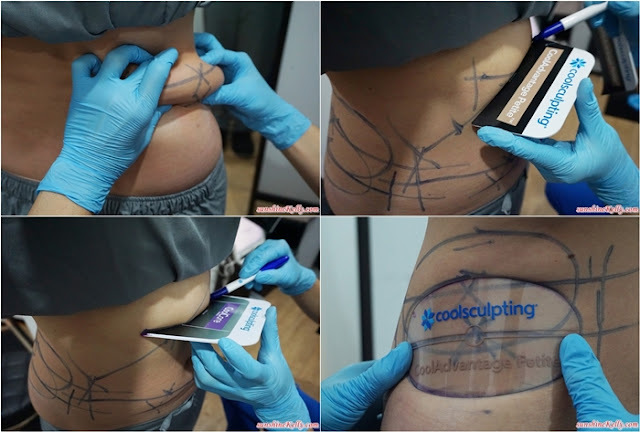 CoolSculpting applicator comes in different sizes to suits the individual body parts. And yes this treatment is safe and effective, although the results might not be immediate. Combined with healthy eating and regular exercise the results will be more visible and faster. Immediate after the treatment there were a bit of sore and bruises but it will go away in a week or less. My concerns areas are my tummy, flanks, thighs, arms and bra-roll. After my consultation and body assessment at Clique Clinic, the doctor decided to concentrate on my tummy and flanks first. 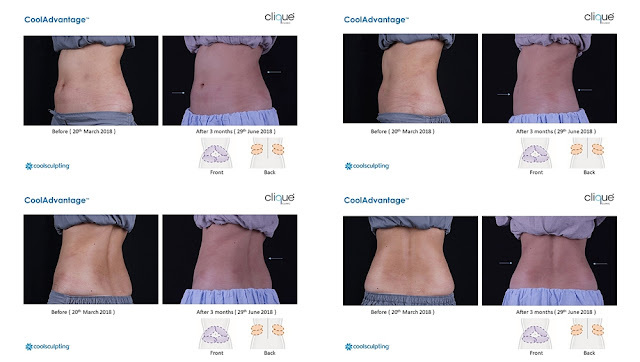 As you can see from the photos, CoolSculpting treatment is highly personalised. For my case, there are total of 8 parts to be treated on my tummy and flanks. 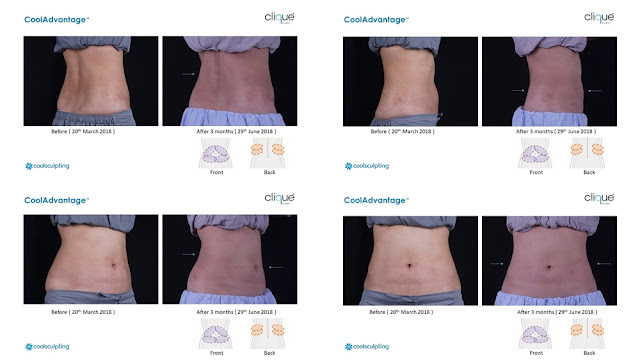 For example, the CoolSculpting Petite is perfect for flanks, inner thighs, or upper arms; where else the CoolCore Advantage is mainly for the bigger areas like tummy. Clique Clinics is the only clinic that has CoolAdvantage Petite applicator in Malaysia by far. I can’t wait to go for my treatment and see the results after that. So now I am ready for my CoolSculpting treatment. First of all the treatment room is comfortable equipped with audio and visual system where I can enjoy watching movie, do my work or have a light meal during my treatment. Each part took about 35 minutes per session and then followed by 2 minutes of massage. During the treatment there was only slight discomfort (tightness from the suction) especially in the first 10 minutes, after that the treated area was numb throughout of 35 minutes. Immediately after the treatment, the clinicians performed 2 minutes massage on the treated areas to breakdown the crystalized fats, it was a bit discomfort or ticklish. The treated areas will be a bit swollen, hardened and cold. However I was able to wear back my blouse and jeans. I was advised to drink more water, eat healthily and also exercise after the treatment. There is no downtime, I am able to go out, and do all daily activities as usual. CoolSculpting applicators come in different sizes to suit different body parts of every individual. For example, the CoolAdvantage Petite is perfect for my flanks; where else the CoolCore Advantage is mainly for the bigger areas like tummy. @clique_clinic is the only clinic that has CoolAdvantage Petite applicator in Malaysia by far. I can’t wait to go back to review my treatment progress in one and three months later. So after a month, I went back for my consultation there were slight improvements. Then I went back to the clinic for my review again after 3 months, there were more visible results. As you can see from my before and after treatment photos plus my current photos, there were improvements and my tummy areas were smaller and sculpted. I can feel and also see the improvements especially on my waist is more curvy, the muffins top is reduced and toned. The fats on the upper part of my tummy used to be hard and bigger now is smaller and softer too. I hope to see more positive results as time goes by and will continue with my healthy eating & lifestyle. Overall now as you can see I am more confident to show off my midriff. I find that as age is catching up and the nature of my job (desk bound) it is very hard to trim down certain part of our body fats especially the tummy and inner thighs. I’m glad that I decided to go for CoolSculpting Treatment. The results are gradual and might take about 1 to 3 months, however the treatment it’s safe, non-invasive, and no downtime. And the services, clinic facilities plus follow-ups at Clique Clinic were really tip top. Location: 4, Jalan 19/36, Seksyen 19, 46300 Petaling Jaya, Selangor, Malaysia.